Gardeners who are limited when it comes to space are always experimenting with ways to grow food vertically, and using hanging pots is often one of the very best options. Even if you aren’t worried about space, growing food crops in a hanging container can be a fun way to add more visual interest to your garden – after all, some fruits and vegetables are just as pretty as flowers. You’ll first need to decide on a location to hang your containers. Most fruits and vegetables grow well in areas that get at least six hours of direct sunlight each day, but you can also locate them in spots that receive less sunshine and use more appropriate plants like herbs to grow in those. Another consideration for your hanging pots is the height. Be aware of how much sunlight your particular plant needs, and remember that full sun reflected by a bright stucco wall or radiated by asphalt is hotter than full sun in a green garden plot. Planters shaded by a building or wall to the south generally won’t get enough sun to foster normal, healthy plant growth, and west-facing windows may toast your plants to death. Feeding your plants regularly becomes even more important when growing them in hanging pots as they’ll deplete the nutrients in the soil quicker than they would if they were planted in the ground. As with any plant that is productive, more flowering and fruiting will occur with regular feeding. If you’re growing tomatoes and other plants that like calcium, you may want to add egg shells. 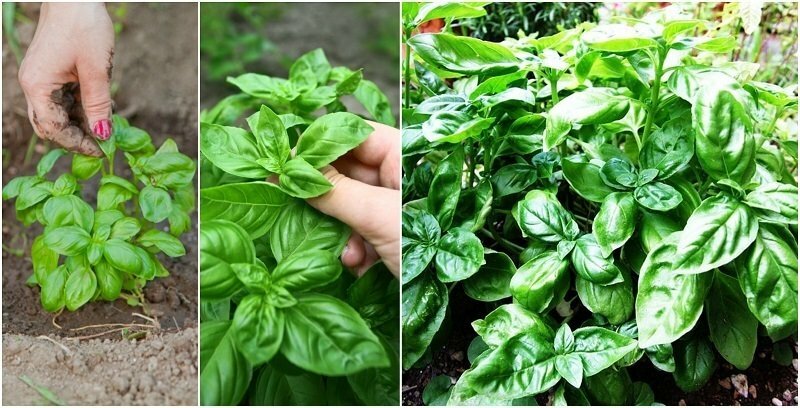 There are a number of homemade fertilizers you can use to help keep any vegetable plant healthy and strong, depending on the particular plant. An Epsom salt fertilizer is great for magnesium-loving plants, including tomatoes and peppers. To make it, simply combine a tablespoon of Epsom salt and a gallon of water in a watering can and use the solution to water your plants, repeating once each month. Do a little research on Google on your specific plant’s needs and you’re sure to have multiple homemade fertilizer recipes. When using hanging containers for your plants, you can also have plants growing from the sides. To do this, you’ll need to make holes in the liner and sides of the container at the appropriate places, cover the seeding tip with a piece of recycled paper as protection, and then insert the seedling from inside, so that the shoot is now on the outside. This will help the plant grow down or from the sides of the hanging basket, covering it with greenery once the plant has taken root and new leaves appear. Herbs like mint are especially good for planting this way, and it makes it easy to harvest them as you need them. Lettuce. Lettuce is great for hanging pots as it’s lightweight and fairly easy to grow. It prefers full sun, except during the intense heat of the hottest summer months, when you’ll need to give them some shade in the afternoon to prevent the leaves from wilting and becoming bitter. Cherry tomatoes. If you’re new to gardening, cherry tomatoes should be your No. 1 pick as they’re the easiest to grow and they look beautiful in a hanging pot too. Look for a bush variety that will stay compact while it trails down the sides of the container – the “Tumbler,” is especially well-suited to this type of gardening, it will easily spread to fill containers, producing attractive clusters of fruit. Be sure to just plant one per pot, as they tend to hog up both nutrients and water. Spinach. Spinach is also a great addition to a hanging pot. Plant three spinach seedlings, or sow spinach seeds and thin to three plants. Try to get them in a triangle layout to give each plant enough room. Chard. Chard is a gorgeous leafy green that’s related to spinach and beetroot. It’s not only incredibly nutritious, but its colorful stems make it an especially attractive crop that can brighten up any area around your home. It even comes in rainbow-hued varieties too. Strawberries. Strawberries are super easy, requiring little maintenance, yet bearing fruit all summer long. Growing them in a hanging container is no different than growing them in a pot on the ground. 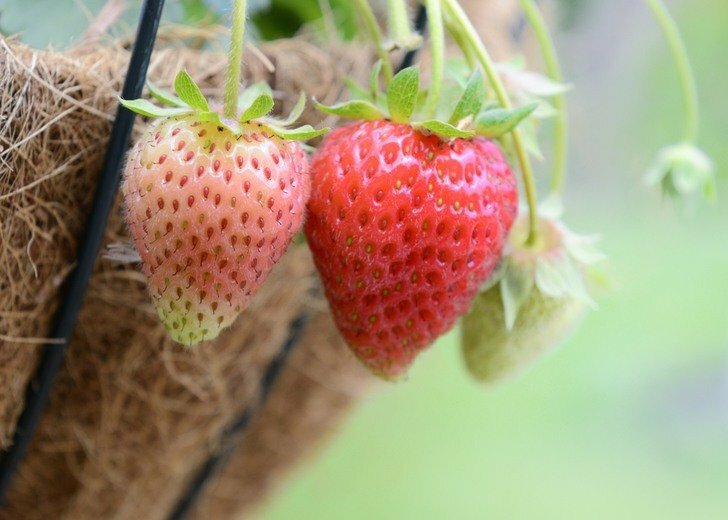 One of the best varieties for this purpose, is sweet alpine strawberries – they’ll even tolerate some shade, but because they have shallow roots it’s especially important to keep them watered frequently. Peas. Peas are also outstanding to grow in hanging pots and they make a visually appealing addition to the garden – just be sure to water them every day so they don’t dry out. Cucamelons. Cucamelons, also known as Mexican sour gherkins, are a great alternative to your standard cucumbers, which tend to weigh hanging containers down too much unless harvested when they’re small. These adorable fruits look like miniature watermelons but are similar to cucumbers in taste. They grow on a thin vine and are surrounded by ivy-like leaves, making them ideal for hanging pots. Place them in a sunny spot and enjoy.